Collenchyma is a living tissue composed of more or less elongated cells with unevenly thick, glistering, primary non-lignified walls. Collenchyma develops from the elongated cells which resemble procambium or from isodiametric cells of the ground meristems. Collenchyma functions as supporting tissue in young growing organs and in mature organs of herbaceous plants. Collenchyma may occur in stems, leaves, floral parts, fruits and roots. In roots, it develops when the roots are exposed to the light. Collenchyma is absent in stems and leaves of those monocots which develop sclerenchyma at an early stage. Generally, collenchyma is present below the epidermis but in certain cases one or two layers of parenchyma may be present between the collenchyma and the epidermis. In stem, the collenchyma is found as a cylinder or I the form of longitudinal strips. In leaves, collenchyma occurs on both sides of the veins and along the margins of the blade. In many plants, the elongated parenchyma cells present outside the phloem strands develop thick walls after the tissue ceases to function. The structure formed is usually termed as Bundle Cap. If the entire bundle is enclosed by thick walled elongated cells, it is said to have a Bundle Sheath. Collenchyma cells vary in size and shape. They may be long with tapering ends resembling the fibers or they may be short, prismatic resembling parenchyma cells. 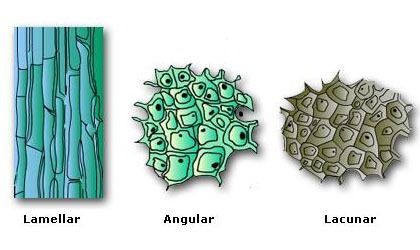 The variations in size and shape are related to the origin of the cells. Cell wall is the most distinctive feature of collenchyma which is characteristically unevenly thickened. Primary pit-fields are present in collenchyma cells in both thin and thick parts of the walls. The walls of the collenchyma consist mainly of cellulose, pectic compounds, hemicellulose and contain much water. The orientation of the cellulose microfibrils in the successive lamellae of the wall is alternately transverse and longitudinal. In many dicots, the collenchyma may become sclerefied. In older plant parts, the collenchyma becomes meristematic and shows active growth when increase in circumference takes place. On the basis of thickenings on the cell wall and arrangement of the cells, the following three main types of collenchyma are recognized. Angular Collenchyma: In this type, the wall thickening is uneven and is deposited in the angles or corners of the cells, e.g., in petioles of leaves of Vitis, Begonia, Cucurbits etc. Lamellar Collenchyma: In this case, the thickenings are present mainly on tangential walls of the cells. Such type of thickenings found in stem cortex of Sambucus nigra and petiole of Cochlearia arnioracia. Lacunar Collenchyma: in this type, the thickenings appear in those parts of the cell wall which face intercellular spaces, e.g., in petioles of species of Compositae, Salvia, Malva, Althaea, etc. An additional type known as Annular Collenchyma is also recognized. In this type the cell lumen is circular in cross section. The collenchyma is a mechanical tissue having considerable elasticity. Therefore, it provides mechanical strength to growing organs. 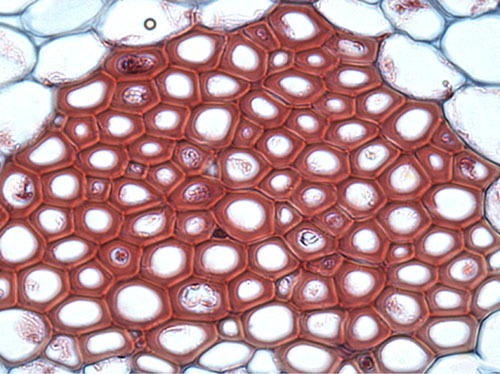 In leaves, the collenchyma is present on both sides of vascular bundles acting as supporting tissue. It is found in the vascular bundles of the leaves by forming bundle caps and bundle sheaths. The Collenchyma with chloroplasts function as photosynthetic tissue. It is a simple tissue composed of thick walled cells, often lignified, whose function is support and sometimes protection. The individual cells are termed as Sclerenchyma Cells. Sclerenchyma cells differ in shape, structure, origin and development. Generally, the sclerenchyma cells are divided into fibers and Sclereids. Fibers are usually defined as long cells and the sclereids as short cells. The term Fiber-sclereids is used in cases where it is difficult to distinguish between the two categories. The sclerenchyma cells lose protoplast at maturity. 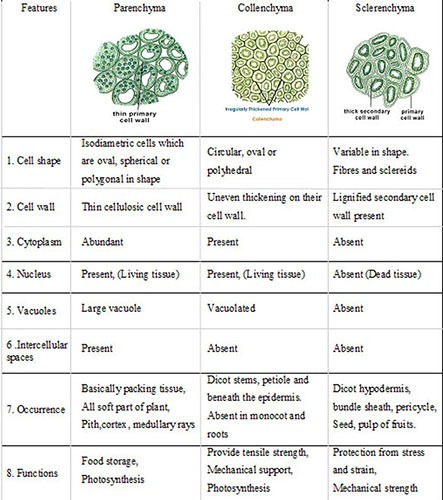 Fibers occur in different parts of plant body. They may occur singly as idioblasts or in the form of bands or a network or a hollow cylinder. Generally, they are found among the vascular tissue but in many cases, they are found in the ground tissue. These are associated with the xylem and develop from the same meristematic tissue as do the xylem elements. The xylary fibers are further classified into two forms on the basis of wall thickness and the type of pits present. Labriform fibers: (Liber-inner bark) They resemble phloem fibers. They have extremely thick walls and simple pits. Fiber Tracheids: Their walls are less thicker than labriform fibers but thicker than tracheids. The pits are bordered but the pit chamber is smaller than those of tracheids. 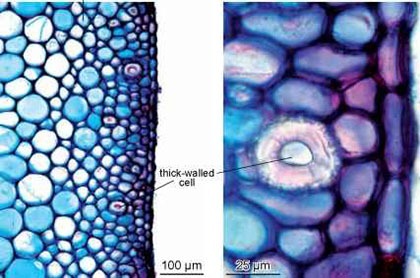 Another type of fibers are found in the secondary xylem of the dicots. These are known as Mucilaginous fibers. In these the innermost layer of secondary wall is rich in cellulose and poor in lignin. This layer is called G-Layer. This layer absorbs much water and may swell up so as to fill the lumen of the fiber.